ABIDJAN- Amnesty International has reported today (10/26/2012) that more than 200 people, many of whom are followers of ex-Ivorian President Laurent Gbagbo, have “been arbitrarily detained and tortured” in Cote d’Ivoire. Amnesty International calls on Ouattara’s regime to stop paying lip service to respecting Human Rights and to actually take tangible steps to ceasing its human right abuses. 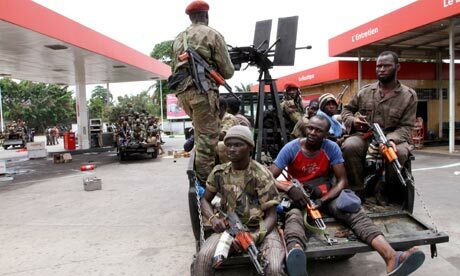 The NGO has published its report at a moment when Ouattara’s administration is facing its most alarming wave of armed contestations in Abidjan since the end of the post-electoral crisis that has caused more than 3000 deaths between December 2010 and April 2011. These attacks, which Ouattara’s interior minister attributed to President Gbagbo’s political party (FPI) without a shred of evidence, became a pretext for the Ouattara Regime to cast a haphazardly wide of indiscriminate arrests. “More than 200 political figures of President Gbagbo’s party as well as suspected supporters of President Gbagbo have been subjectively detained and tortured. Many more are still languishing in jail,” indicates Amnesty International in a communique that summarizes a month-long investigation in Cote d’Ivoire. “We were able to speak with dozens of detainees. They described for us how they were electrocuted and burnt with melted plastic. Two have them were sexually assaulted,” explains Gaetan Mootoo, a specialist of West Africa at Amnesty International. “Many people were detained for several months without being allowed to contact their relatives or seek the counsel of an attorney,” Mootoo explains. He insists that recently more than 400 people have been arbitrarily arrested, which, according to some diplomatic sources, has prompted the foreign embassies in Cote d’Ivoire to send discreet but stern warnings to Ouattara. The promised reform of the security apparatus has never been implemented. In the meantime the army is still largely overtaken by Ouattara’s lawless militias that continue to persecute the populations. Amnesty recalls the attack of the UN-run refugee camp of Nahibly last July by Ouattara’s soldiers. Though the official death count for this attack is 6, half-a-dozen other bodies have been retrieved from a well in mid-October, and the populations insist that they are many more dead bodies to be found. After the discovery of the six bodies, warrants have been issued for the arrest of 2 FRCI soldiers.